I'm in the super busy part of my work year, and rarely have time to post here much. Just wanted to share a little gratitude I'm feeling this morning. It's pouring down rain here, and my commute to the office took 3 times longer than usual. And that was before I got stopped for 10 minutes at the railroad crossing 2 blocks from my office. A year ago (yes, even 4 months into my quit) I would have been reaching for a cigarette several times (a real one prior to 5/15/17, a phantom one after). The thought of smoking never entered my mind until I pulled up to my office and saw 2 people standing in the pouring rain smoking and looking miserable. I'm grateful that I never had even the slightest urge to reach for a smoke during the drive. I'm grateful that I didn't have to choose between rolling my window down a little bit in the pouring rain, or filling my car up with smoke. I'm grateful that I wasn't envious of those 2 smoking outside today. For many months into my quit, I could never imagine writing this post. I was beginning to think I would be miserable forever. So glad I was wrong (cause, you know, being of the male species, I rarely am ). And for the newbies, No, it didn't take me 16 months to feel this way. Maybe 6 or so for me? But it does finally happen, and this morning I'm feeling grateful for it. Isn't it the very best feeling ever?!!! That's what we mean by 'freedom' Congratulations on your amazing quit and may you have a lifetime of gratitude a head of you!! You have a beautiful quit going Tom...its been great watching it grow on you. Congrats. 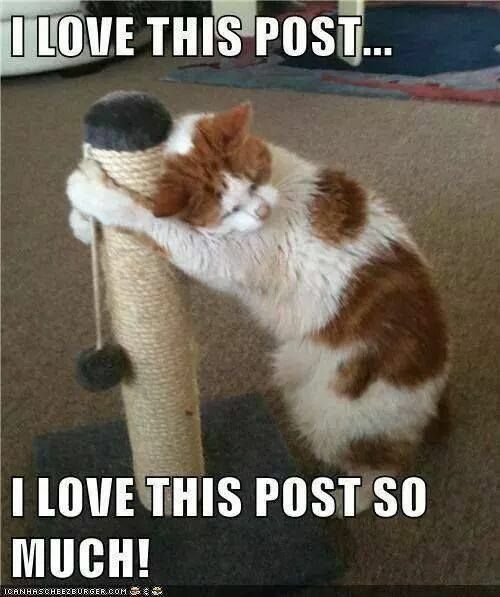 And yes I love this post also ...and the one with the cat! We don't NEED to smoke any more. Ain't that great! Grateful for this post of yours, Tom. I was so unhappy for quit a while after I quit. I had lost a quit at 3 months once for that very reason. So glad I stuck it out this time. I love NOT SMOKING. So glad you are grateful for quitting. Enjoy your day. What a GREAT post, Tom, I am SO happy for you...what a long ways you have come. I am grateful to be smoke free and grateful to be taking care of myself...grateful for being able to observe things that I WOULD have done in the past and have absolutely no draw to them now. That's wonderful news! Thanks for sharing. I can't wait to feel that way! I promise you will! It looks like you are on Day 21 or so. That's the day I joined EX in desperation looking for someone to talk me out of buying a pack of smokes. I gained a bunch of new friends that day, who did indeed talk me down. And as they say, the rest is history! Great job on your quit so far! WTG! I can’t wait til I get to that point. I don’t want one but that addict hiding in my brain sure does if that makes any sense. It makes perfect sense. Except for once on Day 5 and again once on Day 21, I never thought I was in danger of losing my quit. I changed my attitude from "wanting to quit" to "deciding to quit". So even though I knew I didn't want to go buy a pack, I sometimes sure thought just one puff (or 2 or 3) would be OK.
I‘m so glad to have found a way back here and find that you still have a rock solid quit. We quit around the same time so I always looked out for your inspiring blogs, that is until the GDPR thing locked me out. I hope you also find time to write and catch us up on what's been happening with you. So glad you are back!